While lithium-ion batteries are, on the whole, incredibly safe they do very very occasionally catch fire or explode. When it happens, like with Samsung’s Galaxy Note 7 fiasco or HP’s more recent laptop recall, it’s always big news. So what’s going on and why do batteries sometimes go out with a bang? Let’s find out. 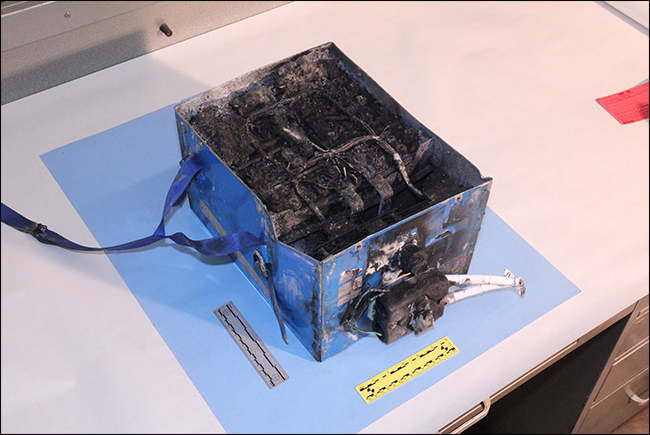 This lithium-ion battery from a Japan Airlines Boeing 787 caught fire in 2013. Rechargeable lithium-ion batteries—the kind of battery that’s inside your laptop, phone, tablet, and pretty much every other modern gadget you own, as well as electric cars and airplanes—are responsible for the portable device revolution. Without lithium-ion batteries, I wouldn’t be able to write this article sitting in a coffee shop; instead, I’d need to be plugged into a power source the whole time. What’s Inside a Lithium-Ion Battery? To understand why lithium-ion batteries sometimes fail, you need to know what’s going on under the hood. Inside every lithium-ion battery, there are two electrodes—the positively charged cathode and the negatively charged anode—separated by a thin sheet of “microperferated” plastic that keeps the two electrodes from touching. When you charge a lithium-ion battery, lithium ions are pushed by electricity from the cathode, through the microperferations in the separator and an electrically conductive fluid, and to the anode. When the battery discharges, the reverse happens with the lithium ions flowing from the anode toward the cathode. This is the reaction that powers your laptop. Small batteries, like those found in smartphones, usually have only a single lithium-ion cell. Larger batteries, like those in laptops, normally have between 6 and 12 lithium-ion cells. The batteries in electric cars and airplanes can have hundreds of cells. What Makes a Lithium-Ion Battery Explode? The very thing that makes lithium-ion batteries so useful is what also gives them the capacity to catch fire or explode. Lithium is really great at storing energy. When it’s released as a trickle, it powers your phone all day. When it’s released all in one go, the battery can explode. Most lithium-ion battery fires and explosions come down to a problem of short circuiting. This happens when the plastic separator fails and lets the anode and cathode touch. And once those two get together, the battery starts to overheat. Bad Design or Manufacturing Defects: The battery is poorly designed, as with the Galaxy Note 7. In that case, there wasn’t enough space for the electrodes and separator in the battery. In some models, when the battery expanded a little as it charged, the electrodes bent and caused a short circuit. Even a well designed battery can fail if quality control isn’t kept tight enough or there’s some defect in manufacturing. External Factors: Extreme heat is nearly guaranteed to cause a failure. Batteries left too close to a heat source—or caught in a fire—have been known to explode. Other external factor can cause a lithium-ion battery to fail, too. If you drop your phone too hard (or too many times), there’s a chance you’ll damage the separator and cause the electrodes to touch. If you pierce the battery (either by accident or deliberately), then you’ll almost certainly cause a short circuit. Charger Problems: A badly made or poorly insulated charger can also damage a lithium-ion battery. If the charger shorts or generates heat near the battery, it can do enough damage to cause failure. That’s why we recommend using only official chargers (or at the very least, high quality third party ones from reputable brands). Lithium-ion batteries do have built in protections to stop them overcharging. While very rare, if these safety precautions fail, overcharging is a good way to overheat a battery. Thermal Runaway and Multiple Cells: While not relevant to single cell batteries like those found in most smartphones (the iPhone X actually has two cells), only one battery cell needs to fail for the whole battery to go. Once one cell overheats, you get a domino effect called “thermal runaway.” For batteries with hundreds of cells—like those in the Tesla Model S—thermal runaway has the potential to be a really big problem. Even though examining why battery sometimes fail paints a frightening picture, lithium-ion batteries are a safe and mature technology. The fact that it’s always news when a battery explodes unexpectedly shows how rare an event those big failures are. Battery manufacturers put a lot of safeguards in place to prevent batteries failing, or at least mitigate the damage a failure can cause.